This machine is now sold please phone for next availability. THIS MACHINE IS LIKES ROLLS-ROYCE. 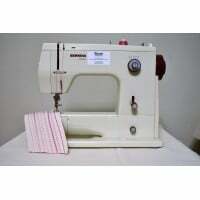 Best machine in the sewing world last forever. The machine has just been serviced and a sample of sewing can be seen in the photograph. THIS MACHINE CAN SEW LIGHTWEIGHT FABRIC TO HEAVY FABRICS WITH EASE. The Bernina 1015 is the best quality machine. It is fully tested, Used condition but still it top shape. The machine is designed and made in Switzerland. The machine comes with everything you see in the picture. This machine can be delivered and installed by a qualified sewing machine engineer and give a free tutorial on how to use the machine.